If your senior loved one doesn’t already have a smartphone, now would be a great time to talk to them about obtaining one and also about internet safety for seniors. Instead of purchasing one online, it would be preferable to take your loved one to the store so that they have the opportunity to look at and play with a variety of different phones and see what type would work best for them. While at the store, ask a salesman about smartphones designed specifically for seniors. For example, GreatCall has a phone called the Jitterbug Smart which features a simplified menu for easy access to frequently used features such as the phone, text messages, email, Internet, camera, and pictures. It also features built-in apps which provide instant access to emergency help, if needed. Additionally, Samsung Galaxy phones have an “easy mode” which converts the phone to a simpler mode of operation with larger icons. Once your loved one has a cell phone, you can have peace of mind knowing they will be easier to reach, can make emergency calls and they will likely greatly enjoy the new ways in which the technology can help them in keeping in touch with family and friends. 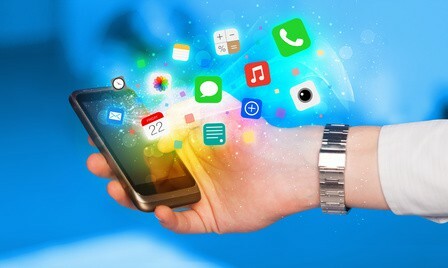 In addition, there are several apps designed especially for seniors which they may wish to download and even a medical alert app called MobileConnect you might enjoy (see our MobileHelp review for more info). Fade uses sensors in your smartphone to detect falls. You can configure the alert app to send a message to a predefined contact when a fall is detected. This message, which can be sent via text and email, reports the time and place of the fall using the phone’s built-in geolocation tools. We can’t speak for the reliability of this app first hand, so be sure to test it out thoroughly before you decide to rely on it for a personal emergency. With the help of a monitor sold separately, this mobile app can help you manage your high blood pressure. It is a blood pressure tracking and analysis tool that creates interactive graphs to show you changes and trends in your blood pressure over time. This app allows blind users to obtain quick answers to questions about their surroundings. The user takes a picture and records a question into their mobile phone. This goes out to object recognition software, Twitter, a designated email contact, and anonymous workers, all of whom can send responses back. This is a wonderful app for anyone who has been prescribed physical therapy for an issue. It can not only help you find a physical therapist in your area, but watch educational videos to help you in your recovery. This smartphone app comes pre-downloaded into every iPhone via the Health app. You can add all your emergency contact information, medical history and even blood type which can be quickly accessed in a medical emergency even if you have your lock screen on. The app instantly turns your smartphone into a magnifying glass. It really comes in handy for hard to read paperwork or even ordering off a menu. It will magnify and light up the text for you. Ride share apps have been around for a few years now and come in handy for seniors who need a quick lift to a doctor’s appointment or to run errands. Simply request a ride and depending on your location or time of day, you could have a driver ready within minutes. Similar to the ride share apps mentioned above, seniors can now order from a significant number of nearby restaurants and have their food quickly and easily delivered to their door by one of these popular apps. Technology for seniors has come far in recent years. Smartphones for seniors can provide that immediate connection they would need in an emergency situation. Also, having your medical information available at a touch of a button could be lifesaving. The latest device on the market is the new fall detection Apple Watch. These smartphone apps for seniors are not only possible for emergency response, they can certainly make life very convenient!